On a whim last weekend, I decided it was time to use the peanut butter chips I’d had in my pantry for who knows how long. A quick Google search of peanut butter chip recipes led me to this one, and within an hour I had quite possibly the best chocolate cookies EVER. I apparently made my cookies a little smaller than the original recipe called for, because I ended up with closer to three dozen than two, but that was a good thing because I brought all three dozen in to the office and they were gone in no time. 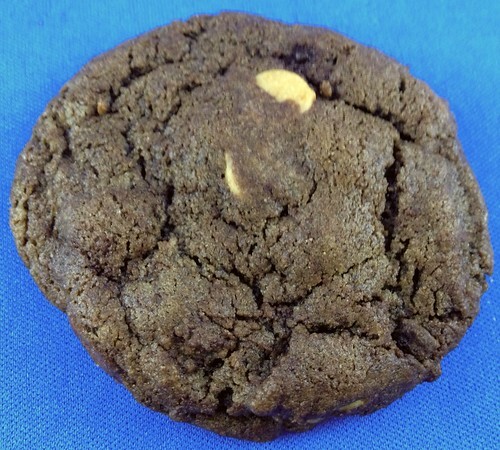 The cookies are soft and chewy with a rich chocolate flavor, and the peanut butter chips added just the right amount of salt and creaminess. They may possibly be the perfect combination of chocolate and peanut butter that you would want in a cookie. Yields 2-3 dozen, depending on size. I’ve been wanting to make a chocolate cookie like this but we can’t do PB chips due to my son’s allergy so I may try these as a double chocolate chip cookie, with milk or semi-sweet chips (not white – he doesn’t like white). So I made these cookies a week and a half ago, using milk chocolate chips. I’m not kidding – my son’s friends are coming over for these cookies even when he’s not home. Just knocking on the door, making a little small talk, then asking for a cookie LOL. Since making these, the boy next door has told me I make the best cookies more times than I can count. So funny since this is one of the most basic cookie recipes out there and most of these kids didn’t even taste them until they were in the cookie jar about a week. I used Ghiradelli cocoa and chips in these.